The love of God is Foolishness …. Don’t blame me for saying this; blame the apostle Paul. In his letter to the church at Corinth, Paul said he was not there to preach signs to placate the Jews or to preach wisdom to placate the Greeks; he was there to preach Christ crucified. His message was “a stumbling block to Jews, and foolishness to Gentiles” (1 Corinthians 1:23). From a human perspective, God’s love simply does not make sense. “For the message of the cross is foolishness to those who are perishing” (v. 18). To those who don’t know that the cross is a message of God’s love, it is foolish to believe God would save us by dying. Indeed, God’s love is unbelievable, it’s preposterous, it’s profound, it’s radical. Think about it. You live in absolute perfection. You are the epitome of unity and communion. Your life is embodied by love, joy and peace, and you decide to radically alter everything. I just described the beginning of creation, when Father, Son and Holy Spirit lived in perfect unity, in absolute communion. They are of one mind, one goal, one passion. Their existence is embodied by love, joy and peace. And they decide to change everything by sharing all that they are with something not yet created. So they create humanity and call us the children of the Father. They created men and women, you and me, to enjoy relationship with them for eternity. But they created us with a caveat. They did not want to demand we behave a certain way in order to be in that relationship. They wanted us to choose to be in that relationship. So they gave us freedom of choice. And because they gave us this choice, they knew most would choose poorly. So they created the plan. Not a back-up plan, not Plan B, but the plan. And this plan was for God the Son to become human and for God the human to go to the cross and die. That’s foolishness, to most. That’s radical love. I recently visited a country in Asia where people worship hundreds of deities. Followers spend their lives trying to gain favor with these gods. They want to keep the gods happy so they won’t be cursed. They spend their lives afraid they aren’t doing enough. The idea that one of their gods would become human to help them, out of love, would seem absolutely foolish to them. He took all of our filth and foolishness upon himself and made us clean before our Papa/Father. That’s Radical love. The Son, however, did not think it was foolish. It was a decision based on love. He loved us enough to throw off his robe of light and attach himself to the placenta of a young Jewish girl. “The Word became flesh and made his dwelling among us” (John 1:14). That seems a foolish thing for a God to do. That’s radical love. As a human, he lived with fishermen and tax collectors—the normal and the despised of society. He spent time with lepers, the demon possessed, and sinners. The religious leaders called him foolish. That’s radical love. In John 8 we read that when a woman caught in adultery was brought before him, the leaders wanted to stone her. But Jesus said, “Let him who is without sin cast the first stone.” They all left. And Jesus, the only one who was without sin, said, “I don’t condemn you. Go and stop doing what you are doing.” Foolishness to many. That’s radical love. Jesus ate in the homes of sinners. Foolishness, the religious leaders said, he’s not keeping himself pure. Their sins will influence him. He will become like them. Radical love says, no; by loving sinners, they will become like Jesus. Jesus—Son of God and Son of Man—allowed himself to be arrested, tortured and murdered so that by his shed blood we could be redeemed, forgiven and reconciled. He took all of our filth and foolishness upon himself and made us clean before our Papa/Father. That’s radical love. Sharing the message of the cross is sharing the experience of the radical, transforming love of Jesus. In fact, the whole of Christianity is based on love—the life-giving love of Jesus and his followers. Then he was buried. On the third day he rose from the grave to move beyond giving us redemption, forgiveness and reconciliation. He rose from the grave to give us life. He told his disciples, “When I go I will return, and when I return I will be in you and you will be in me” (John 14:20). That’s crazy talk. That’s radical love; that’s radical life. He then ascended to our Father and, because of “his great love with which he loved us,”—this “foolish” radical love—“even when we were dead in our trespasses, made us alive together with Christ—by grace you have been saved—and raised us up with him and seated us with him in the heavenly places in Christ Jesus” (Ephesians 2:4-6, ESV). Yes, while still sinners—before we even had the chance to repent—God took us in and loved us. This is radical love. It is in and through Jesus the Son of the Father that we are included. That same Father then placed us—with Jesus—at his right hand. Then that same Father invited us to participate in what he is doing—sharing that radical love and that radical life with others. God’s plan is foolishness to many. It’s a plan of radical love. “Because of that obedience, God lifted him high and honored him far beyond anyone or anything, ever, so that all created beings in heaven and on earth—even those long dead and buried—will bow in worship before this Jesus Christ, and call out in praise that he is Master of all, to the glorious honor of God the Father” (Phil. 2:9-11, The Message). Jesus died for all humanity because of love that appears foolish. And he has invited us to participate in this love that sometimes makes no sense, but helps others understand radical love. Let me share one such example of radical love. We have a ministry partner in Nepal—Deben Sam. Almost every week after church Deben goes to the village where we have a free medical clinic for the poorest of the poor in and around the brickyards of Kathmandu. Nearby, Deben has built a farm project for the churches and the orphans, and here is one area where Deben shares the gospel. A short time ago, Deben was robbed and severely beaten on his way home and accused of bringing false hope to the village. He was accused of bringing religious pollution—his message is considered foolishness to those who do not know the message of the cross. 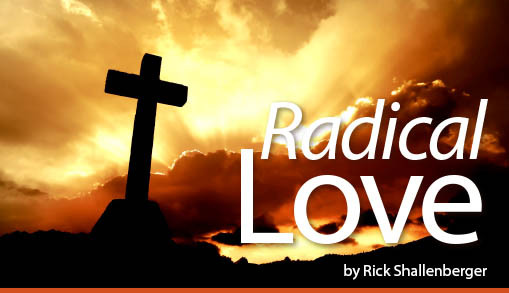 Our ministry partner, who has since recovered, practices radical love. The very love God has asked us to share with all—even those whom we consider enemies. That’s how we lay down our lives for others. Sharing the message of the cross—the message of God’s love—is sharing the experience of the radical, transforming love of Jesus. In fact, the whole of Christianity is based on love—the life-giving love of Jesus and his followers. It’s foolish love, and sometimes, humanly speaking, it simply doesn’t make sense. It’s not a love we know with our intellect, but with our hearts. It’s radical love. Easter is about the love a Papa/Father has for all of his children—including those who don’t know they are his beloved. The Father gave his Son. His Son gave his life. He died for ALL. He rose from the grave for ALL. His love is for ALL—those who know him, those who don’t know him yet.